The Nomad Factory LM-662 Dual Limiting Amplifier is a recreation of the classic Fairchild 660 limiter. When using the LM-662, music and instruments reacts the same as a Fairchild 660 does. The Nomad Factory LM-662 Dual Limiting Amplifier is built to be a new classic by adding that vintage warmth and realism to the most demanding studio tracks. The Nomad Factory Program Equalizer EQP-4 is a full range stereo channel unit, featuring low and high cut, low and high frequency boost and attenuation (shelving or peaking) as well as two overlapping bands of equalization. The two mid-range frequency sections has variable bandwidth, boost/attenuation (peaking) and frequency selector. All these features allow the Program Equalizer EQP-4 to handle several EQing chores, from the subtleties of mastering to radical tone shaping often needed during tracking. The simple beauty of these EQ is nothing else than amazing!. Intended to recreates the warmth of classic analog hardware equalizers, the Program Equalizer EQP-4 will add that magic touch to your music. 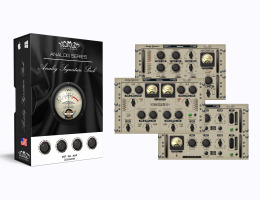 The Nomad Factory Studio Channel SC-226 is a stereo channel recording plug-in, featuring four band equalizer, an analog "signature" optical compressor and at the heart of the shelving and bell filters, a tube simulator and Brick-Wall peak limiter designed to reproduce the warmth of vintage recordings with unrivaled quality and realism. The Studio Channel is tube style virtual equalizer / compressor. It is equally suited for delicate vocal as well as dynamic instrument recordings such as lead guitar, bass guitar, drums and horns. The algorithm was designed to emulate the response of a high-end vintage analog equalizer/compressor. Exceptional for tracking, mixing or mastering, the Studio Channel recreates the warm sound qualities of its analog hardware ancestors.